Yesterday after an unsuccessful trawl around my local shopping centre I was feeling disheartened. It would seem I’m in-between sizes as everything I tried was either too small or too big, the one dress that fitted was bright orange and I could foresee taunts involving Tango from my nearest and dearest. When a sales assistant came and asked me if I was ok, as I’d been there “an awfully long time”, I decided it was time to head home. On my drive back I passed Mela Mela Vintage and popped in. They’ve got such a beautiful range of vintage clothes and although it’s always pot luck what sizes there are, they have some gorgeous stock. 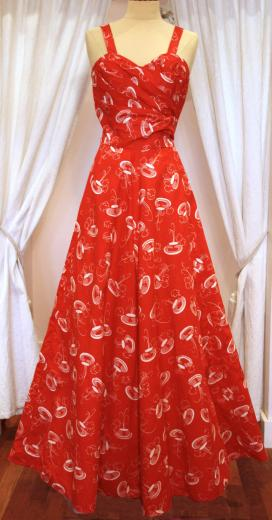 First on my list of hankers is this red and white long 1950s sundress. Such a beautiful cut that frankly left everything I’d seen on the high street in the shade and at £130 it’s a lot less than many dresses on the high street. At first I thought the print was of teacups with steam coming out but on closer inspection I saw they were actually fountains. Although I loved it, I didn’t get it as I just don’t wear long dresses and after toying with the idea of getting it altered to be shorter, I decided that would be an awful waste of such beautiful material. 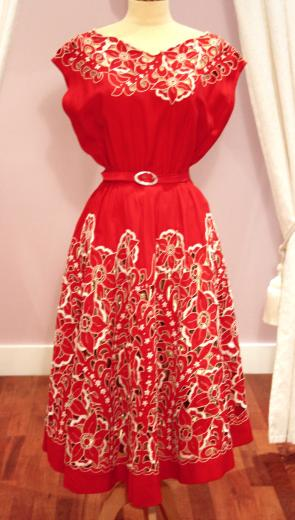 Also in red and white was this stunning 1950s crepe dress with embroidery and cut away detail. 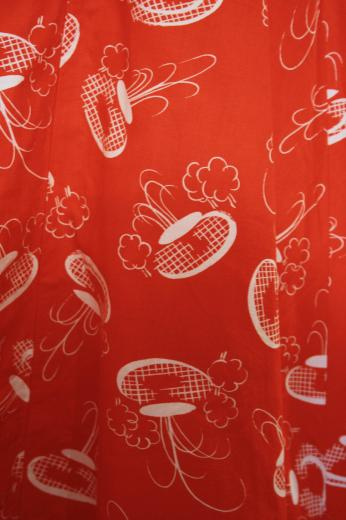 You’d have to wear a slip underneath this but a blue or yellow one would look great, or even a bright clashing pink. At £175 it is a little more, but it’s in such good condition and still has the original belt. 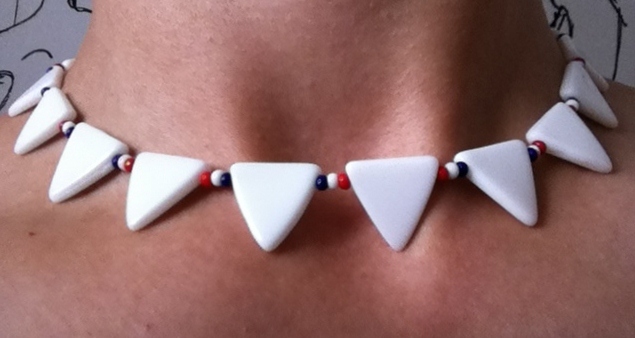 I left with this plastic bunting style necklace from the 60s/70s which I picked from a lovely display of red, white and blue jewellery in one of the many display cabinets. At £25 it put a smile on my face. Enter your email address to follow my hankerings and receive notifications of new posts by email.